While mobile is transforming the shopping experience in many ways, results from our 2013 Holiday Shopping report find that women still prefer to conduct the bulk of their holiday shopping from home and on their desktop device. The study shows 82% of women prefer to shop for holiday gifts from home, 21% prefer to shop from work, and 12% of women are “showrooming” and conducting their shopping while in a brick-and-mortar store. In terms of device usage, 87% of women indicate that they use their desktop computer to shop for holiday gifts, while 34% of women use a smartphone, and 30% use a tablet. Women between the ages of 18 and 34 still prefer to shop from home but are slightly more likely to shop from work. They are less likely to shop while in a store. 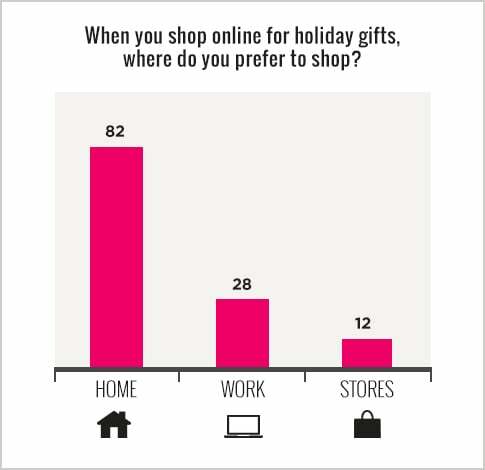 When asked to select only one device to use to shop or purchase their holiday gifts online, most women stuck with their desktop computer (79%) followed by their tablet (15%) and smartphone (6%). Women 18-34 who earn less than $100K in household income are more likely to prefer to shop or purchase from their desktop computers. Women over the age of 35 or those who have a household income of over $100K show an increased interest in shopping from their smartphone or tablet (30% as compared to 21% for all women). When asked to select only one device for holiday shopping, women 18-34 are less likely (19%) than women over the age of 35 (30%) to choose a smartphone or tablet computer. Economic factors may play a key role in driving multiple device ownership and usage. Marketers should embrace the fact that while the majority of women still currently use their desktop device to shop for holiday gifts, the age of the omni channel consumer is here, and consumers are increasingly comfortable shopping and purchasing on their mobile devices. This is especially true of women over the age of 35, based on the results of our study.